In a large glass measuring cup, combine coffee, 2 tablespoons of caramel and cocoa mix. Whisk until combined. Stir in the half & half. Microwave for 1 minute, or until hot. Stir in a pinch of ground sea salt. 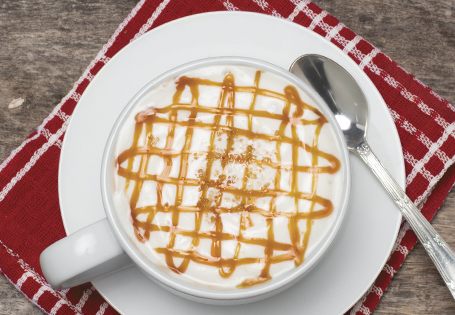 Drizzle remaining caramel onto the sides of two mugs. Divide the cocoa mixture between the mugs. Top with desired amount of whipped topping. In a small bowl, combine ¼ teaspoon ground sea salt and brown sugar. Sprinkle on top of each mug. Drizzle additional caramel over the top, if desired. Serve immediately.